And what about heroines? Obviously, they are not as wide-spread as their male colleagues in fictional and generally artistic representationsa situation which actually is a challenge to delve deeper into this matter. Graduate students as well as professors of Comparative Literature present their points of view focusing on most different issues raised by the topic. 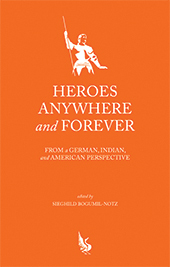 The contributions from India, Germany, and America trace back the item to the early Sanscrit drama and the songs of the Buddhist nuns (Theri) from 600 BC and exploring the use and the incessant reconstruction of the hero or heroine up to the actual political commitment in Indian films and literatures and the pop-cultural nostalgias in the Power Metal. They present a transcontinental topographical panorama encompassing a historical outline of the changing significations of the concept particularly in Europe and finally focusing on the threshold where the notion is fading away. Thus this book is an implicit defence of the hero and heroine without considering the actual somewhat futile usages of the term. The contributors demonstrate that it is not worthwhile to state this decline rather that it is a pleasure to consider the way heroes and heroines are (re-) constructed in a work of art. What Is a Heroine, Who Is She? Kriegerin  Path of a Heroine? Sieghild BOGUMIL-NOTZ was Akademische Rätin with the department for Comparative Literature at Ruhr-University Bochum.